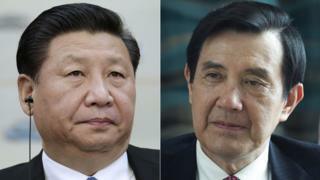 Taiwan's President Ma Ying-jeou will meet his Chinese counterpart Xi Jinping in Singapore on Saturday - the first ever meeting between leaders of the two sides. Both said the talks would focus on relations across the Taiwan Straits. China claims sovereignty over Taiwan and views the island as a breakaway province which will one day be reunited with the mainland. But ties have improved since President Ma took office in 2008. The Chinese government threatens to use military force against Taiwan if it ever attempts to gain outright independence. Taiwanese spokesman Chen Yi-hsin said President Ma's aim was "to promote peace cross the Taiwan Strait and maintain status quo". This meeting, less than three months before Taiwan's elections, is a sign of how concerned China is that the significantly improved ties of recent years could be jeopardised if the pro-independence opposition party's candidate becomes president. Opinion polls show Tsai Ing-wen is leading - a big worry for Beijing. Ms Tsai has said she welcomes dialogue with Chinese leaders, but Beijing has refused to meet her, indicating it does not trust her. She was a minister in charge of developing policy toward mainland China under the previous administration, which angered Beijing by trying to work towards formal independence. Mr Xi may believe he can sway Taiwanese voters but this could backfire. While some voters who want to maintain stable relations may heed his words, they may offend Taiwanese voters who are already worried that Beijing will have increasing influence over Taiwan if the candidate from President Ma's party is elected. And this could hurt, rather than help, the party favoured by Beijing. The two leaders are expected to handle the meeting in a delicate manner. Mr Ma's office has emphasised no agreements will be signed and no joint statement will be issued. Mr Ma will hold a news conference on Thursday to explain his decision to hold the talks. More details are also expected from Taiwan's mainland affairs council later on Wednesday. China's official Xinhua news agency said the two sides would "exchange views on promoting the peaceful development of cross-Strait relations". The BBC's John Sudworth in Beijing says Saturday's meeting will mark a significant break with the long-established diplomatic stance. Contact of any kind between the two sides has been extremely limited and China has resisted anything that might be seen to be giving Taiwan equal status, he says. In a sign of how politically sensitive the meeting is, the leaders will address each other as Mr Xi and Mr Ma, rather than president, one Chinese government official has said. White House spokesman Josh Earnest said the US welcomed any steps to reduce tensions and improve relations, but added: "We'll have to see what actually comes out of the meeting." Ties with China have improved under President Ma, whose Kuomintang (KMT) party is seen as pro-Beijing. In July 2009 the two leaders exchanged direct messages for the first time in more than 60 years, albeit in their respective party functions, and not as national leaders. A year later, the two countries signed a historic trade pact. However, correspondents say growing fears over China's influence has led to widespread dissatisfaction in Taiwan. The KMT suffered a crushing defeat in local elections last year, a result that was widely seen as a rejection of President Ma's push for closer ties with China. Mr Ma steps down next year having served two terms, and earlier this month the KMT dropped its candidate for January's presidential election following a series of poor ratings in opinion polls. Analysts say China is likely to see a meeting between the two leaders as a final chance to press its case for improved ties, in case the KMT loses the election. China has insisted that countries cannot have official relations with both China and Taiwan, with the result that Taiwan has formal diplomatic ties with only 21 UN member states. Taiwan also has no seat at the UN, having lost it to China in 1971. Repeated attempts to regain representation at the UN have been blocked.